If you have been reading my blog long I am sure you have read about my daughters. Since they both started running they have been a regular and favorite subject of my blog. Last year my younger daughter Payton killed it in Cross Country her freshman year, and both Payton and Ashlee did great this past Track Season. Both Ashlee and Payton will be running Cross Country this fall and I am super excited. As fun as Track is, Cross Country is still my personal favorite. From a spectator's perspective it is sometimes harder to watch, but I think that is one of the things that find to be just that much more invigorating. I sometimes get up to a mile run in just getting from one point to the other to cheer them on. Summer conditioning has been going on since the first week in June. Of course, for my girls, it started just a couple weeks after their last track meet, after the obligatory 2 weeks off. It has been exciting to watch as they have grown and making such strides in their training over these past couple months, even lately as they both reached new distances in their long runs. I am a bit behind on mentioning this, but a few weeks ago they ran their first time trial as a team. 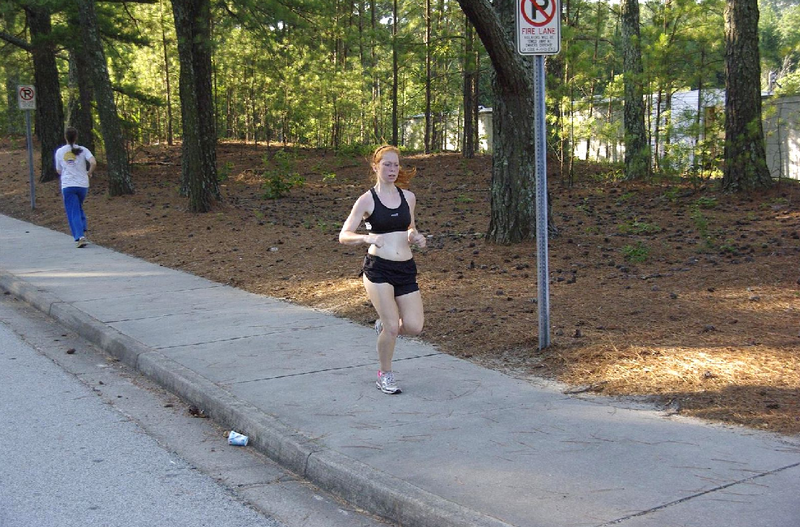 This time trial was to see where everybody was in their current state as well as determine who would be going on the summer trip to Myrtle Beach. only the first 20 would be going, plus some of the top Freshmen. 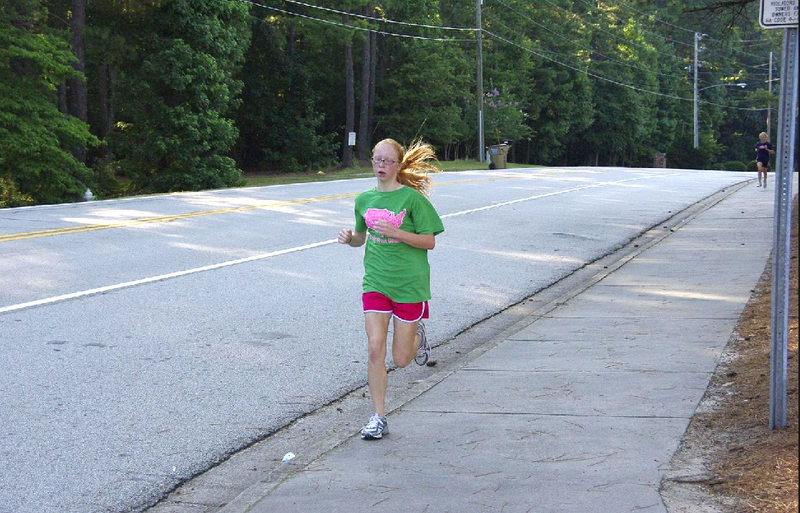 Payton finished this time trial well last year and was able to go. We didn't have a lot of concern about her making it this year, but Ashlee was worried and really, really wanted to be able to go. Ashlee worked hard and asked a lot of questions about the times of the top 20 last year. She was trying to make sure she was running the 2 miles around the pace that qualified last year. With nearly 100 girls running the time trial it is always a big event and a lot of fun to watch. 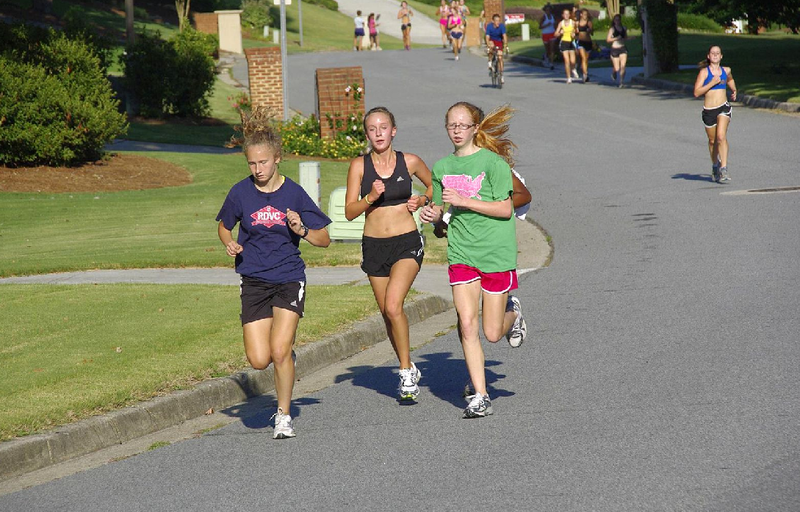 The time trial is kinda like a road race since it is currently run through a neighborhood and ending in front of the school. The plan this year was to run the time trial at the local park, but the county has been doing some repairs to the Cross Country course and it is currently not runnable. The time trial is a 2 mile course and is mostly flat. A lot of it is run on the same roads at the S.W.A.T. Trot. I can't hold the suspense any longer...... both of them qualified in the top 20 16! Payton (Red-head in the green shirt in the pics) came in second overall with a time of 12:44. Not to take anything away from her, but two of our top runners are currently injured and were not able to run. As far as I am concerned..... she came in second..... end of story! :) Ashlee (Red-head in black in the pics) also did really well, and much better then she expected with a 16th place finish in a time of 14:11. They both finished strong and ran a great race! How often do you see bumper stickers on cars that say "My child and my money goes to schools name?" Well, I kinda feel the same way, but this is a blog, and Myrtle Beach is not a school..... really. So here it goes..... "My children and my money are in Myrtle Beach" and even though it is a lot of $ and I am having to eat bread and peanut butter, I am thrilled that they were both in the top 20 (out of 100! ), and able to go enjoy themselves (and run a lot!) in Myrtle Beach. Words cannot express how proud I am as a parent. I am looking forward to a really exciting Cross Country Season! That is awesome!! Congrats to both girls and to their running dad!! 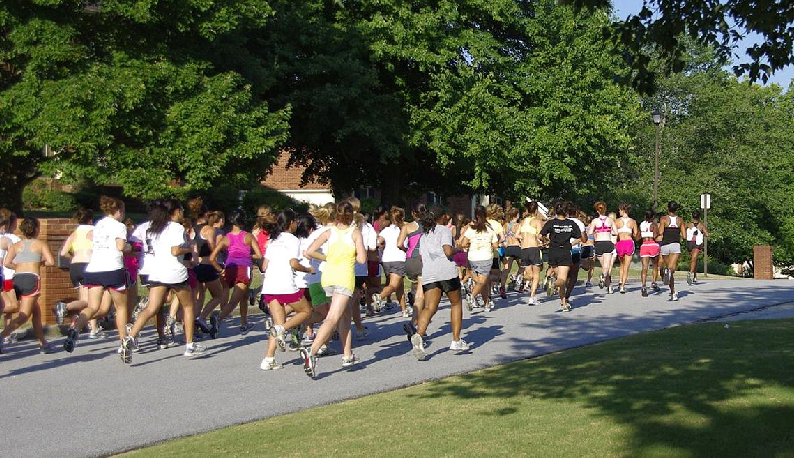 It really is fantastic to see you and your daughters enjoying running! I'm sure that all the support they've gotten from their dad over the past months helped a lot. :) You have a couple talented (and pretty!) kids. That's great! Hope they have a great trip, they really earned it. that's awesome. I can identify with you now because my son's decided to run cross country for his freshman year at school this fall. I never even pushed him into running. The coach has had some optional practices during the summer, and it turns out my son's pretty freaking good! I'm so excited for him to share my love of running with me! The other day he was telling me about a really hard practice, and he said something like: "it's REALLY hard and you feel like throwing up and ask yourself why you're doing this...but then at the end you finish and you're so PROUD of yourself." Boy can I identify with THAT, huh? so cool. Wow, this is huge! Congratulations to the proud dad!